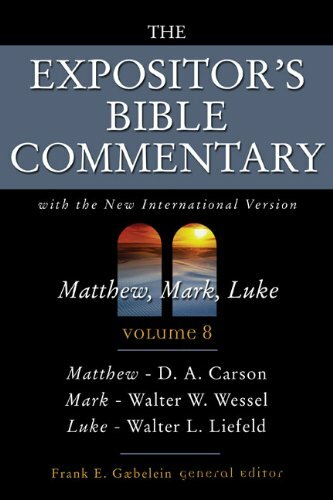 [PDF] The Expositor's Bible commentary : Matthew, Mark, Luke, with the New international version of the Holy Bible (Expositor's Bible commentary, Vol.8) | Free eBooks Download - EBOOKEE! Posted on 2017-10-30, by luongquocchinh. Description: The Gold Medallion Award-winning Expositor's Bible Commentary is a major contribution to the study and understanding of the Scriptures. Providing pastors and Bible students with a comprehensive and scholarly tool for the exposition of the Scriptures and the teaching and proclamation of their message, this twelve-volume reference work has become a staple of seminary and college libraries and pastors' studies worldwide. No comments for "[PDF] The Expositor's Bible commentary : Matthew, Mark, Luke, with the New international version of the Holy Bible (Expositor's Bible commentary, Vol.8)".